The Hebrew word in the narrative that is translated into English as bush is seneh (סנה səneh), which refers in particular to brambles; seneh is a biblical dis legomenon, only appearing in two places, both of which describe the burning bush. 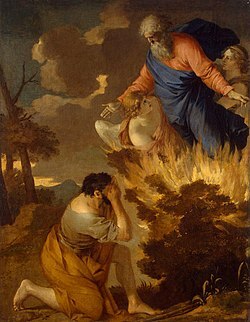 It is possible that the reference to a burning bush is based on a mistaken interpretation of Sinai (סיני Sînāy), a mountain described in Exodus 19:18 as being on fire. Another possibility is that the use of seneh (סנה) may be a deliberate pun on Sinai (סיני), a feature common in Hebrew texts. 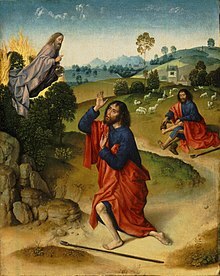 Moses and the Burning Bush, c. 1450–1475, attributed to Dieric Bouts. In the narrative, an angel of the Lord is described as appearing in the bush, and God is subsequently described as calling out from it to Moses, who had been grazing Jethro's flocks there. When Moses starts to approach, God tells Moses to take off his sandals first, due to the place being holy ground, and Moses hides his face. Some Old Testament scholars regard the account of the burning bush as being spliced together from the Yahwist and Elohist texts, with the Angel of Yahweh and the removal of sandals being part of the Yahwist version, and the Elohist's parallels to these being God and the turning away of Moses's face, respectively. When challenged on his identity, Yahweh replies that he is the God of the Patriarchs – Abraham, Isaac, and Jacob – and that he is Yahweh. The text derives Yahweh (יהוה) from the Hebrew word hayah (היה) in the phrase ehyeh ašer ehyeh, meaning "he who is he", or "I am that I am". According to the narrative Yahweh instructs Moses to confront the Egyptians and Israelites and briefs the prophet on what is to take place. Yahweh then performs various demonstrative miracles in order to bolster Moses's credibility. Among other things, his staff was transmuted into a snake, Moses's hand was temporarily made leprous, and water was transmuted into blood, In the text, Yahweh instructs Moses to take "this staff" in his hands, in order to perform miracles with it, as if it is a staff given to him, rather than his own; some textual scholars propose that this latter instruction is the Elohist's version of the more detailed earlier description, where Moses uses his own staff, which they attribute to the Yahwist. Christian hermits originally gathered at Mount Serbal, believing it to be the biblical Mount Sinai. However, in the 4th century, under the Byzantine Empire, the monastery built there was abandoned in favour of the newer belief that Mount Saint Catherine was the Biblical Mount Sinai; a new monastery – Saint Catherine's Monastery – was built at its foot, and the alleged site of the biblical burning bush was identified. The bush growing at the spot (a bramble, scientific name Rubus sanctus), was later transplanted several yards away to a courtyard of the monastery, and its original spot was covered by a chapel dedicated to the Annunciation, with a silver star marking where the roots of the bush had come out of the ground. The Monks at Saint Catherine's Monastery, following church tradition, believe that this bush is, in fact, the original bush seen by Moses, rather than a later replacement, and anyone entering the chapel is required to remove their shoes, just as Moses was said to have done so in the biblical account. However, in modern times, it is not Mount Saint Catherine, but the adjacent Jebel Musa (Mount Moses), which is currently identified as Mount Sinai by popular tradition and guidebooks; this identification arose from Bedouin tradition. Mount Serbal, Mount Sinai, and Mount Saint Catherine, all lie at the southern tip of the Sinai peninsula, but the peninsula's name is a comparatively modern invention, and it was not known by that name at the time of Josephus or earlier. Some modern scholars and theologians, favor locations in the Hijaz (at the north west of Saudi Arabia), northern Arabah (in the vicinity of Petra, or the surrounding area), or occasionally in the central or northern Sinai Peninsula. Hence, the majority of academics and theologians agree that if the burning bush ever existed, then it is highly unlikely to be the bush preserved at St Catherine's Monastery. In Eastern Orthodox parlance, the preferred name for the event is The Unburnt Bush, and the theology and hymnography of the church view it as prefiguring the virgin birth of Jesus; Eastern Orthodox theology refers to Mary, the mother of Jesus as the Theotokos ("God bearer"), viewing her as having given birth to Incarnate God without suffering any harm, or loss of virginity, in parallel to the bush being burnt without being consumed. 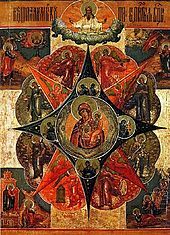 There is an Icon by the name of the Unburnt Bush, which portrays Mary in the guise of God bearer; the icon's feast day is held on 4 September (Russian: Неопалимая Купина, translit. Neopalimaya Kupina). 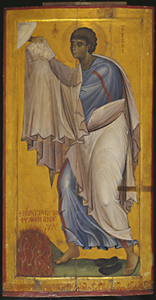 While God speaks to Moses, in the narrative, Eastern Orthodoxy believes that the angel was also heard by Moses; Eastern orthodoxy interprets the angel as being the Logos of God, regarding it as the Angel of Great Counsel mentioned in the Septuagint version of Isaiah 9:6; (it is Counsellor, Almighty God in the masoretic text). The symbolic meaning of the burning bush has been emphasized in Christianity, especially among participants in the Reformed tradition of Protestantism. Judaism also attaches symbolism to it. The motto of the Church of Scotland is Nec tamen consumebatur, Latin for "Yet it was not consumed", an allusion to the biblical description of the burning bush, and a stylised depiction of the burning bush is used as the Church's symbol. Usage dates from the 1690s. The Burning Bush is also used as the basis of the symbol of the Presbyterian Church in Ireland, which uses the Latin motto Ardens sed virens, meaning "Burning but flourishing", and is based on the biblical description of the burning bush. The same logo is used from the separated Free Presbyterian Church of Ulster. The burning bush is also the symbol of the Presbyterian Church in Canada, Presbyterian Church in Australia crest, Presbyterian Church of Eastern Australia with the motto in English since its foundation in 1846: 'And the Bush was not consumed', Presbyterian Church in New Zealand, Presbyterian Church in Taiwan, Presbyterian Church in Singapore, Presbyterian Church of Brazil, the Presbyterian Church in Malaysia, the Free Reformed Churches of North America, and the Christian Reformed Churches in the Netherlands. According to the Quran, Musa departed for Egypt along with his family after completing the time period. The Qur'an states that during their travel, as they stopped near the Tur, Musa observed a fire and instructed the family to wait until he returned with fire for them. When Musa reached the Valley of Tuwa, God called out to him from the right side of the valley from a tree, on what is revered as Al-Buq‘ah Al-Mubārakah (Arabic: الـبُـقـعَـة الـمُـبَـارَكَـة‎, "The Blessed Ground") in the Qur'an. Musa was commanded by God to remove his shoes and was informed of his selection as a prophet, his obligation of prayer and the Day of Judgment. Musa was then ordered to throw his rod which turned into a snake and later instructed to hold it. The Qur'an then narrates Musa being ordered to insert his hand into his clothes and upon revealing it would shine a bright light. God states that these are signs for the Pharaoh, and orders Musa to invite Pharaoh to the worship of one God. The Baha'i Faith believes that the Burning Bush was the voice of Baha'u'llah. Professor Benny Shanon's controversial hypothesis speculates that the key event of the Old Testament might refer to a psychedelic experience with DMT. Some varieties of Acacia trees that grow in the holy land contain the psychedelic substance DMT. In his paper, Biblical Entheogens: a Speculative Hypothesis, Shanon details parallels between the effects induced by the entheogene DMT-containing brew ayahuasca, and the Bible's account of the life of Moses. Also Rick Strassman, who studied the effects of N,N-dimethyltryptamine DMT on human subjects in experimental conditions, suggests in his book "DMT and the Soul of Prophecy: A New Science of Spiritual Revelation in the Hebrew Bible" that DMT experiences may most closely resemble those visions found in the Hebrew Bible's model of prophecy. DMT alone is not orally active. Without the concomitant administration of an enzyme inhibitor, DMT is rapidly converted into a non-psychoactive metabolite. Ayahuasca as traditionally prepared does include such an inhibitor. ^ Fleisher, Alexander; Fleisher, Zhenia (January – February 2004). "Study of Dictamnus gymnostylis Volatiles and Plausible Explanation of the "Burning Bush" Phenomenon". Journal of Essential Oil Research. 16 (1): 1–3. doi:10.1080/10412905.2004.9698634. ^ Humphreys, Colin (2006). Miracles of Exodus. Continuum International Publishing Group. p. 73. ^ Patrick Laude (2011). Universal Dimensions of Islam: Studies in Comparative Religion. World Wisdom, Inc. p. 31. ISBN 9781935493570. ^ Andrea C. Paterson (2009). Three Monotheistic Faiths – Judaism, Christianity, Islam: An Analysis And Brief History. AuthorHouse. p. 112. ISBN 9781434392466. ^ Jeffay, Nathan (6 March 2008). "Moses saw God 'because he was stoned - again'". the Guardian. Retrieved 25 September 2018. ^ Strassman, Rick J. (1 February 1994). "Dose-Response Study of N,N-Dimethyltryptamine in Humans". Archives of General Psychiatry. 51 (2): 85. doi:10.1001/archpsyc.1994.03950020009001. ISSN 0003-990X.